Spring finally arrived here in Malta and with it our firsts DSD’s! Who can resist the call of the crystal clear surrounding sea? I certainly can not! It’s been a nice start of the day. As every Sunday morning the Island of Malta is really quiet and everything seems to stop for a while, at least until lunch time. Sunday is my favourite day of the week especially as there is no traffic on the roads and everybody seems more relaxed and cheerful. In addition to that we have a beautiful blue sky. So, to make a long story short, you can smell spring all around you. Going back to the diving now, I had two nice German ladies this morning on a DSD course which basically means, first experience with diving. It’s like looking at someone who walks for the first time. There is a lot going on during this course and you can see all sort of emotions going through their faces at different times. Its a good mixture of excitement, adrenaline, fear and uncertainty, all at once. Then there is the instructor, the person you have to connect with and the one you have to trust. If you can embrace all this and somehow get to the next step, you will sure have a great time and you will never forget about your first breath underwater. I think the instructor plays a really important role in all this. 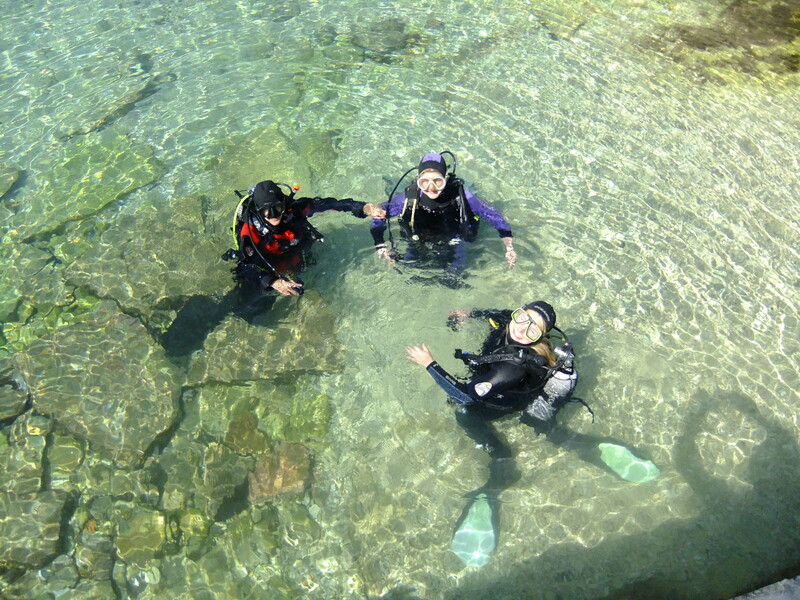 Sometimes, if you get unsure about what is going on around you underwater a simple reassuring look from the instructor can make a big difference to your experience. The experience will start with a short briefing, in which you give to the students the basic knowledge and understanding of the underwater world. It sounds easy but is not always like that, considering that the students arrived from every single corner of the word and even if we, at Divewise, have instructors who speaks more than one language, sometimes you really have to use your imagination in order to make yourself clear… being Italian helps as we can speak with the hands!!! At this point you get into your equipment and in few minutes you’ll experience a whole different word. The student is usually unsure at this point as everything feels very different and you don’t really know how to deal with it yet. Then you put your regulator in your mouth and you take your first breaths underwater and once you realize you can actually breathe, and it’s ok to do it, you start to relax and this is when the first smile arrives on your face. First smile because after that you will discover such a beautiful world and it’s quite nice to see how people smile around their regulators. Now you can see the excitement and the joy in their faces and nothing is better than that. They will slowly get into the right position and suddenly they will be swimming all around you… and this is usually when the instructor have to chase them!!! They finally get out of the water and it’s all about what they have just done which, to be honest with you its what makes my day. So thank you to Christina and Maria, my two girls from this morning for being such a great students. Previous Previous post: Time to say goodbye..